Update: Fish Lane Apartments on the corner of Melbourne and Cordelia streets is now under construction. The project has also hit a funding milestone with 75% of the building sold, which includes three of the four ground floor retail tenancies. This has triggered the green light from financiers. Settlement is expected late 2013. South Brisbane is well placed to facilitate the inner city’s next growth spurt. While the inner north has provided for much of the new supply over the past three years, DA’s have now been lodged and approved by Metro, Aria, and Pradella for major projects in the inner south. The prime corner site which remained vacant for two years was bought by GDL Group in early 2011 for $2.95 million from SSI Pty Ltd and will soon house ‘Fish Lane Apartments‘. The development comprises of 48 one and two bedroom apartments in total, with only 6 units per floor, giving the apartment building a good lift ratio of 1:24. One bedroom apartments will start at $360K with two bedroom, two bathroom apartments from $550K. 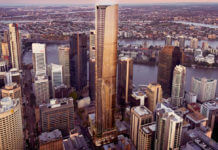 The tower also has the added benefit of having 80% of units facing the Brisbane CBD. 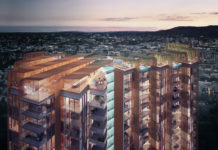 Three sky terraces are also planned for the apartment tower (shown in the above image). 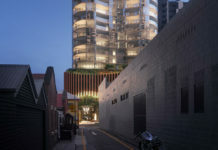 The tower’s design intention is to enhance street level amenity by offering five retail tenancies on ground level, with one tenancy stretching around to Fish Lane which will help to activate the laneway. The project will also extend West End’s vibrant restaurant and cafe scene further towards the CBD. Fish Lane Apartments complies with the Brisbane City Council local neighbourhood plan which allows for a maximum of 10 storeys in this immediate area. 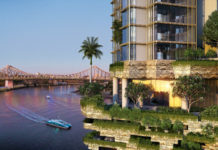 The development joins a growing number of new proposals in South Brisbane and West End following an overwhelming shift towards inner city living in Brisbane. 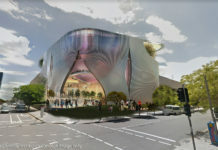 In 2010 the Brisbane City Council contracted Archipelago to undertake a study and design concept into Fish Lane which runs parallel to Melbourne Street from the Cultural Centre. Archipelago developed a masterplan based on site analysis and workshops with key stakeholders of the local area. “A more detailed concept design was developed for the area between Grey and Hope Streets. The distinguishing feature of this precinct is a broad piece of overhead rail infrastructure that connects South Brisbane station with Roma Street. In this years budget, the Brisbane City Council reinstated funding for the Vibrant Laneways program which was put on hold by the January flood event. Funding for the program is expected to continue indefinitely.